As Hillary Clinton Testifies, How Will Libya Shape Her Legacy? : The Two-Way The partisan feuding in Washington has eased over the deadly attack in Benghazi, Libya. But as the secretary of state testifies, Libya and other countries in the region remain unsettled. Secretary of State Hillary Clinton testifies Wednesday before the Senate Foreign Relations Committee on the attack on the U.S. mission in Benghazi, Libya. 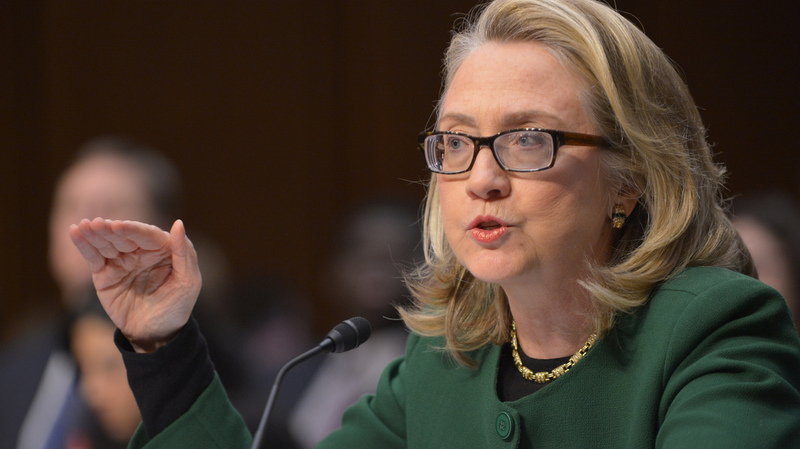 A feisty and combative Clinton said she took responsibility for what happened in Benghazi. But she insisted the Obama administration did not intentionally mislead the American public when it initially indicated that the attack grew out of a protest over an anti-Islam film. Clinton also said that prior to the attack, she did not see requests for additional security at the U.S. diplomatic mission in Benghazi. Sen. Rand Paul, R-Ky., said he viewed that as grounds for dismissal. "Had I been president at the time and I found that you did not read the cables from Benghazi, you did not read the cables from Ambassador Stevens, I would have relieved you of your post," Paul said to Clinton. "I think it's inexcusable. Clinton, meanwhile, became emotional when she recalled the day that the coffins of the four slain Americans were returned to the U.S.
"I stood next to President Obama as the Marines carried those flag-draped caskets off the plane at Andrews [Air Force Base in Maryland]," she said. "I put my arms around the mothers and fathers, the sisters and brothers, the sons and daughters, and the wives left alone to raise their children." Clinton has not said what she plans to do next. But Wednesday's testimony raised the question of how events in Libya may affect her legacy as secretary of state. 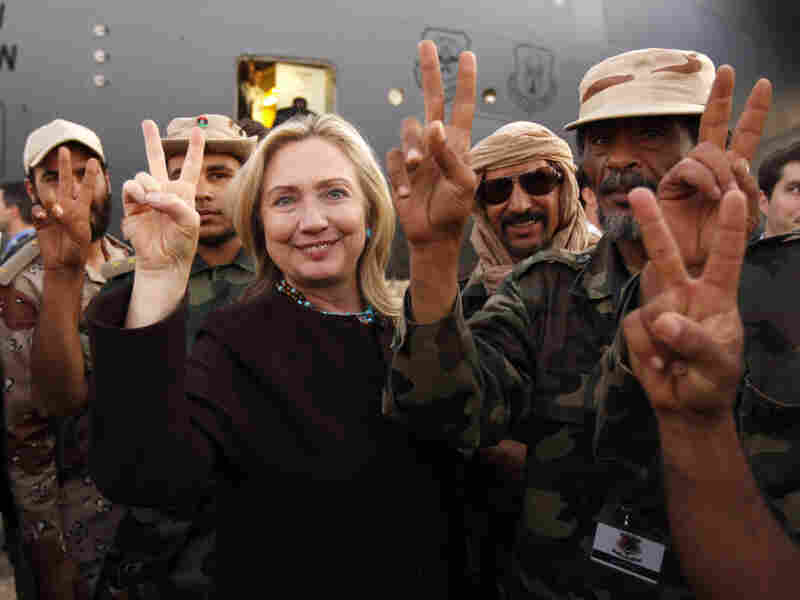 Will she be remembered as a leading proponent for U.S. military involvement in Libya, which helped topple Gadhafi? Or will that be overshadowed by the deadly attack on Americans in Benghazi that followed? During questioning by the Senate committee, Republicans focused on the dispute over the Obama administration's account of the Benghazi attack. The U.S. ambassador to the United Nations, Susan Rice, and other officials initially referred to protests in Benghazi that spiraled out of control, rather than calling it a terrorist attack. The Obama administration now acknowledges there were no protests in Benghazi. But Republicans continued to press Clinton on the administration's handling of case. "The answers, frankly, that you've given this morning are not satisfactory to me," said John McCain, the Arizona Republican who has been one of the sharpest critics. "People don't bring RPGs [rocket-propelled grenades] and mortars to spontaneous demonstrations." Clinton was feisty in her responses, as this C-SPAN video illustrates. When Sen. Ron Johnson, a Republican from Wisconsin, pressed her on the details of what the administration knew in the days immediately after the attack, Clinton said, "What difference, at this point, does it make?" "It is our job to figure out what happened and to do everything we can to prevent it from ever happening again," she said. "The fact is, people were trying in real time to get to the best information." The State Department did not immediately interview the Americans in Benghazi, Clinton said, because her department did not want to be seen as interfering with an investigation by the FBI and others. Clinton's testimony comes at a time of growing turmoil in north and western Africa. Libya's new leaders are still attempting to establish control, Mali is embroiled in a civil war, and last week, dozens were killed after extremists seized a gas plant in Algeria. "The Arab revolutions have scrambled power dynamics and shattered security forces across the region. And instability in Mali has created an expanding safe haven for terrorists who look to extend their influence and plot further attacks of the kind we saw just last week in Algeria." At the first of two congressional hearings today during which she's expected to face tough questions about last September's attack on the U.S. mission in Benghazi, Libya, Secretary of State Hillary Clinton began by telling senators that "as I have said many times ... I take responsibility." "Nobody is more committed to getting this right," the outgoing secretary also told the Senate Foreign Relations Committee. "I am determined to leave the State Department and our country safer, stronger, and more secure." We'll continue to monitor her appearances and update with highlights. Secretary of State Hillary Clinton was a strong supporter of the U.S. involvement in Libya in 2011 that helped oust the country's long-time dictator, Moammar Gadhafi. U.S. and NATO air power was seen as crucial in helping Libyan rebels topple Gadhafi, who was among several autocrats driven from power in the Arab uprisings. But now, as Clinton prepares to depart her post, she goes before Congress on Wednesday to talk about the more recent upheavals in the region that haven't gone as planned. Her testimony before separate Senate and House committees is set to focus on the Sept. 11, 2012, attack that killed the U.S. ambassador and three other Americans in Benghazi. Libya. Yet her appearance, which has been delayed by injury and illness, comes at a time when Algeria and Mali have also been rocked by unrest. Islamist rebels, including some who previously fought for Gadhafi, have seized northern Mali. French troops have gone to Mali to support the government in the south, and the U.S. has provided planes to assist the French. In addition, three Americans were among dozens killed when Islamist radicals seized hostages at a remote gas plant in eastern Algeria, near the Libyan border. As NPR's Michele Kelemen reported on Morning Edition, "Secretary Clinton readily admits it has been difficult for the U.S. to gather intelligence in what she calls one of the most remote areas on the planet." An independent panel found there was "grossly inadequate" security at the U.S. mission in Benghazi prior to the attack (an unclassified version of that report is posted here). One State Department official has resigned and three more are on administrative leave. The attack also demonstrated how difficult it has been for Libya's new leaders to establish control over armed groups, a problem that's growing in the region. "You now have more jhadists who are free to roam around. Many have been released or escaped, broken out from prison. [They have] more access to lethal weapons, because weapons have been abudant in Libya in particular, but elsewhere as well, as these uprisings were taking place." The Senate Foreign Relations Committee's hearing is set to start at 9 a.m. ET. The House Foreign Affairs Committee's session begins at 2 p.m. ET. C-SPAN plans to webcast the hearings here. We will update later with highlights.